We had beautiful weather this weekend. My family had a blast enjoying the time outside! All the awesome weather made me think of the great trips we have planned this summer. So far my two kids (2.5 years and 10 months) and I have at least two road trips and one cross country flying trip planned for the upcoming months. 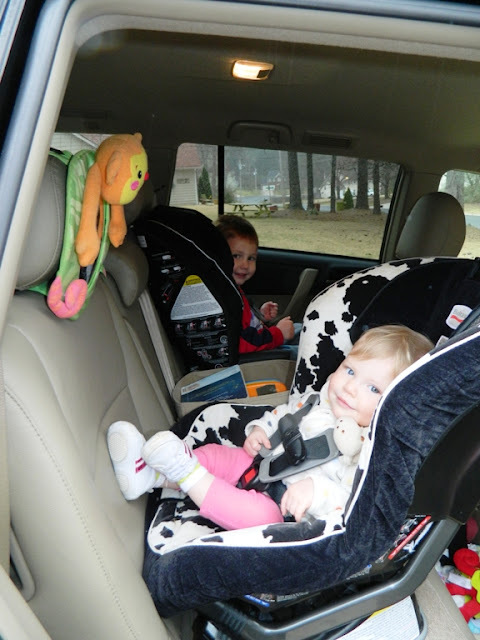 What to do with two little ones in the car for an extended period of time or on a plane for hours at a time? We like to take some of the wonderful Montessori activities from home with us when we travel and have some great resources to help you plan your next road/flying trip! With a little pre planning and some organization, I know I can make the long trips we have planned this summer enjoyable. 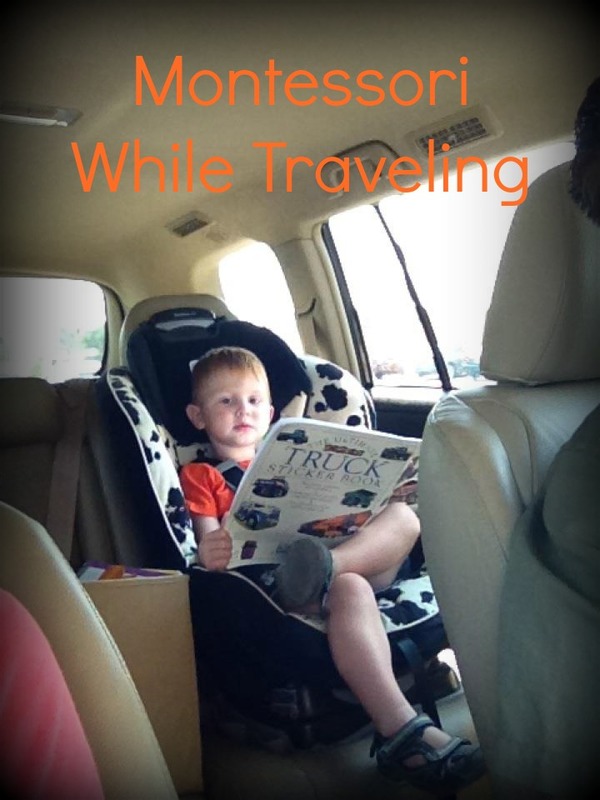 My kids are already amazing travelers, but being a well prepared Momma always helps! We always pack snacks. Something the kids can eat without supervision and that can be passed back with one hand from the front. Pretzels, fruit bars, and a cup of milk is my son's (2.5yo) car snack of choice. My daughter (10 months) loves to nibble on graham cracker pieces. She still nurses full time so I'm sure to schedule a little extra time into our rest stops for her to have something to drink as well. Scheduling extra time into stops really helps our family when we take road trip. My son is fully potty trained, but my daughter still needs diaper changes. We add in a couple extra minutes to our trip plan for her to get changed and for him to use the bathroom. Getting out and walking around helps everyone's moral it seems like, so if possible we use the restroom at a rest stop where there is some grass to get all the wiggles out. When we are flying, I try to plan our flights with a layover long enough for us to walk around, use the bathroom, and get a snack. I find it is easier to keep kiddos occupied with two smaller flights than with on long one. Planning quality, in the car/on a flight entertainment has helped our trips stay positive and happy for everyone. My son loves to point our colors of cars, big trucks, and letters, since we have been working on his alphabet. Most of our trip is spent on this kind of "I Spy" game. We have a box of books buckled in between the two kids for our road trips. They can both reach in and grab a new book when they would like something to read. We often choose one toy to go with us on a trip. My son might choose his Wolverine "guy" and my daughter loves to have a cup or ball for entertainment. Giving the kids the ability to entertain themselves helps us keep the Montessori Method with us as we go. We pack books and toys in a "Mommy bag" to carry on for our flying trips. There are some awesome resources out there to help you Montessori while you travel with your children. Victoria Road Montessori (now Garden Montessori) has put together some very helpful information on activities to have with you when you travel. Living Montessori Now Pinterest page is a wealth of Montessori activities that you can DIY to use while traveling with kids. Mom Most Traveled has some great toys she has used with her children from A Toy Garden and some ideas about finger puppets. For Small Hands has an amazing resources on making your own travel kit. The kits are divided into age appropriate groups (3-6 and 6-9). My baby girl is going to get some new activities too. A new I Spy bag, that can be switched out with different textures (colored rice, beans, shaving cream, etc.) and a discovery bottle from Holly's Arts and Crafts Corner.